It is very rare to have allergies to raw chocolate and cocoa, but they do occur. Most of the time when someone has an allergic reaction to chocolate, it is actually a reaction to the additives that are put with the chocolate when it is processed. When chocolate is manufactured, it can have up to 300 ingredients added if not more. Some of the ingredients added to chocolate are syrup, corn, nuts, gluten and caffeine. Purchasing higher quality chocolate will ensure that fewer additives are included during the manufacturing process. Once your body ingests an allergen its immune system will begin to fight it. Your immune system will create histamines and antibodies to fight the proteins in chocolate causing an allergic reaction. The symptoms your body experiences from the allergic reaction can range from mild to severe symptoms. When more than one of the ingredients added to chocolate causes an allergic reaction, you will notice a shortness of breath. You may also feel dizzy, stomach ache, nausea, tightness of the chest and vomiting. If it is severe enough to cause anaphylactic shock, avoid chocolate at all costs. Depending on how allergic you are, you may notice a rash on the skin around the face and neck. The rash may eventually spread to other parts of the body. It may require a bit more investigation to determine if the sharp headache is actually caused by the chocolate; but the caffeine in the chocolate may cause a sharp headache. Due to the stimulant in chocolate known as theobromine, which causes the heart to beat faster, chocolate is great for lifting spirits when you feel depressed. However, those with an allergy to chocolate can experience the opposite and become restless and irritable. Some people may experience heartburn after eating chocolate. 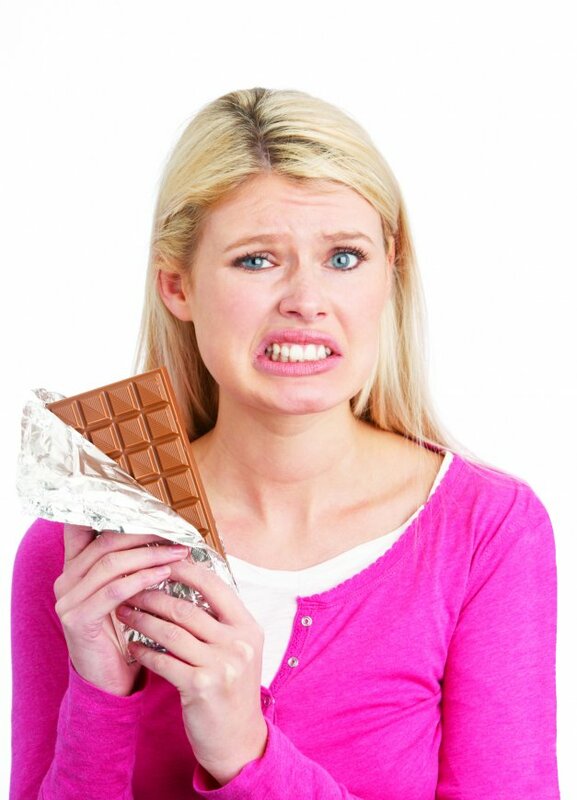 This is a minor symptom that will not harm your health so it is not necessary to stop eating chocolate all together, just be aware that you may continue to get heartburn. When people experience itching on their legs, arms, face or hands, it is because the area has come into direct contact with the chocolate. Although itching is one of the least worrisome reactions and is more of a nuisance, avoiding chocolate all together is the best option to prevent it from occurring. How to Know Which Ingredients in Chocolate You're Allergic To? Your doctor will ask you to refrain from eating chocolate for a period of time and then will give you a piece of pure chocolate. This will determine whether you are allergic to cocoa or other ingredients added to chocolate. Then there will be a series of skin and blood test that will determine the cause of your allergic reaction. Most chocolate uses milk or other milk products such as casein and whey. They also use soybean products such as soy lecithin in lower quality chocolates. They are all common triggers of food allergies and intolerance. Not only does some chocolate contain nuts, but much of the chocolate is manufactured in facilities that also produce nut products so trace amounts can be found in chocolate which might lead to food allergies. Mass-produced chocolate products such as candies contain wheat and/or gluten. Wheat can cause food allergy while gluten intolerance. Corn products such as corn-syrup are commonly used in chocolate bars and other chocolate products which could be the source of allergy. Additives are added to foods to help preservation, taste, texture, nutrition and color. Some of the most common additives that cause allergies are Butylated hydroxyanisole (BHA), butylated hydroxytoluene (BHT), Tartazine, Nickel, and other dyes and flavorings. Chemicals such as caffeine, theobromine, phenylethylmine and tyramine may cause headaches and mood swings. The best remedy for reducing allergic reactions is to avoid eating chocolate and other food products that contain chocolate. There are home remedies and other medicinal remedies that can relieve the symptoms when chocolate is consumed. Inhaling the vapors from 2-3 drops of eucalyptus oil put in boiling water can help clear the respiratory tract and sinuses. Use the herb yarrow to remove the burning sensation from the eyes and reduce a runny nose. Eat equal amounts of sugary candy and coconut or get a message with rosemary water to reduce headaches. Covering a rash on your skin with a paste of sandalwood and rose water will reduce the itching and redness. Antihistamines will help reduce itchiness, rashes, digestive pain and sneezing. Corticosteroids and bronchodilators will help reduce runny nose, shortness of breath, coughing and sneezing. All food companies are required to list their ingredients and preservatives; always check food labels for additives and ingredients whether you are buying chocolate or other foods. Cocoa is used in many foods and can go undetected. Keep in mind that when you think you may have a food allergy, always consult your physician. Allergies and their tests can be life threatening. A physician will provide a safe environment where you can receive immediate treatment.